Franklin County has a rich agricultural history, so it was no surprise that several different farmers spoke at the public forum hosted by the Cannabis Control Commission (CCC) in Greenfield. The forum, which was hosted on Tuesday, is one of 10 public forums happening all over the state through February 14. The forums are a chance for public to bring their thoughts and concerns about the draft regulations to the CCC before the final draft is released, which needs to happen by March 15. Members from the Cannabis Control Commission listen to statements at Tuesday’s public forum in Greenfield. Photo by Meg Bantle. Andrea Benjamin is a dairy farmer in Orange who would like to integrate selling cannabis clones into her business. Clones are cannabis plants in the vegetative stage, or pre-flowering stage, that are taken from an existing female plant. By selling clones, Benjamin could provide starter plants to people who would like to cultivate cannabis at home, but there is currently nothing in the draft regulations that distinguish a clone business from a business that grows flowering plants. “A cannabis clone could be considered a gateway plant to a lifelong passion for gardening,” Benjamin joked. Benjamin was one of over 60 people who packed the room at the John W. Olver Transit Center. Other farmers and agricultural supporters praised the draft’s inclusion of a craft marijuana cultivator cooperatives and encouraged the CCC members to keep costs low for local farmers to prevent the “Walmartization” of the industry. In addition to farmers, there were many representatives from Franklin County towns who brought up the difficulties they are having with zoning regulations. Peggy Sloan, the director for planning and development at the Franklin Regional Council of Governments, mentioned that only two towns in the county have professional planners and that some of the volunteer planners are struggling with issues related to zoning. She asked for further guidance on a few different issues, including on determining the number of non-retail establishments there can be. The complexity of regulating the budding Massachusetts cannabis industry was on full display on Tuesday. While Sloan and others asked for more guidance from the CCC, others asked for towns and cities to have more autonomy. Included in the long list of contentious issues was the speed that recreational cannabis regulations are happening. While some people in the industry feel like Massachusetts has been moving too slow to create these regulations, others asked the CCC to slow down. Patriot Care is set to open a dispensary in Greenfield next month. Mayerson asked that social consumption regulations in particular be put off to the future. The issue that was talked about by the most people on Tuesday was the issue of keeping cannabis away from children and minors. 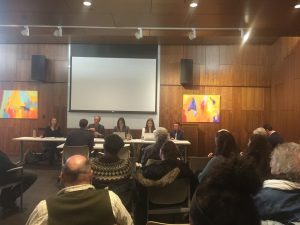 Several different people who work with youth in Franklin County spoke about their concerns and asked that the CCC set stronger zoning restrictions to prevent cannabis businesses from popping up around schools, preschools and other places where families and teenagers might congregate like youth centers. The draft regulations currently stipulate that a marijuana establishment cannot exist within 500 feet of public or private schools grades 1 through 12. Lev Ben-Ezra, Community Action’s director of youth programming, spoke about the disproportionate impact of substance abuse on different groups, particularly LGBTQ youth and youth of color. She also noted that people who live in federal housing can receive a lifetime housing ban for cannabis use or possession, which are both still illegal on the federal level. Ben-Ezra asked that cannabis retailers be required to provide more educational materials about those risks, and about safe storage practices to keep cannabis away from children. Leverett resident Cecelela Tomi also spoke about the importance of including diverse voices in the conversation about cannabis, particularly because communities of color have been more affected by the criminalization of cannabis. Tomi suggested that the CCC include ways to financially assist entrepreneurs from those communities with the licensing fees associated with a cannabis business. Chairman Steven Hoffman and Jennifer Flanagan attended the meeting to represent the CCC. Hoffman said that he has been impressed by the turnout at the public forums and the preparation that people put into their comments.